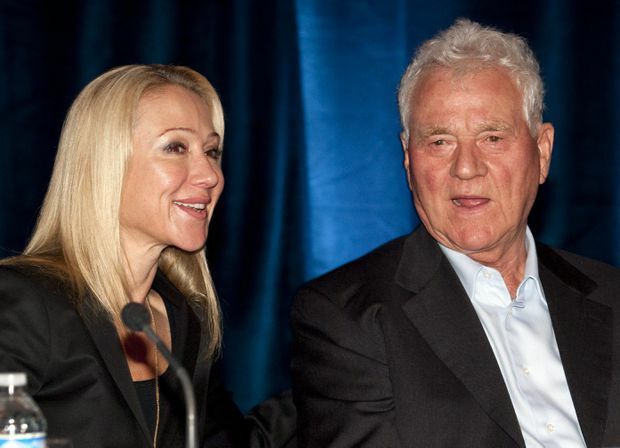 Magna International Inc. chairman Frank Stronach, right, and executive vice-chair Belinda Stronach chat at the company's annual general meeting in Markham, Ont., in May, 2010. Like a boxer who has stepped into the ring too many times, entrepreneur Frank Stronach is seeing his business reputation take a pounding in an increasingly nasty courtroom battle with his daughter and her allies for control of the family’s fortune. At the age of 86, Mr. Stronach should be basking in the glow of his Business Hall of Fame achievements as founder of Magna International Inc., now one of the world’s largest auto-parts companies. The Austrian native’s failed side ventures – remember Frank’s Energy Drink, with the ad campaign in 2006 that featured lederhosen-clad women and the slogan “keeps you yodelling all night long”? – would be amusing footnotes to a storied career. Instead, Mr. Stronach launched a court fight last October against daughter Belinda Stronach, two of his grandchildren and Alon Ossip, former chief executive of The Stronach Group, that is likely to define his legacy around projects that failed, rather than as the story of a penniless immigrant who turned the tool-and-die operation in his garage into a $21-billion global business. Mr. Stronach has been launching one new venture after another since the 1980s. A handful made significant money; in particular, the industrialist has shown a deft touch in real estate. Others came and went without leaving a significant dent in a family fortune that amounted to $1.6-billion in 2011, when Mr. Stronach cut ties with Magna and sold his stock in the company. Along with the energy drink, which came and went in a matter of months, there was a tennis equipment company, a soccer league, a lifestyle magazine and a restaurant. These businesses were sideshows. Mr. Stronach’s public image was defined by his role as founder of Magna, an industrial company known for innovation. Now, credit for Magna’s success may shift to current CEO Donald Walker, who joined the company in 1987 and has been CEO, or shared the top job, since 2005. Instead, Mr. Stronach’s legacy is likely to be determined by a family fight over a series of unprofitable ventures, most of which he launched after leaving Magna. When he asked the Ontario courts to hand back control of the family businesses, something he relinquished to his daughter to run for political office in Austria, Mr. Stronach opened the door to public scrutiny of his business acumen. Outside of auto parts and real estate, it’s not a pretty picture. Legal documents filed in an Ontario court by Ms. Stronach, her two adult children and Mr. Ossip portray Mr. Stronach as an entrepreneur who got lucky once, then lost his touch and refuses to admit it. In another legal filing, from family-owned Stronach Consulting Corp., Ms. Stronach and her allies outline the scope of the Magna founder’s future spending plans. In addition to a grass-fed beef operation that has consumed an estimated US$324-million, Mr. Stronach had plans for dairy operations, chickens and pigs, fish farms and a pet-food facility. He is alleged to have planned to launch theme parks near a Stronach-owned racetrack in the Miami suburbs, and in his native Austria. There’s no longer much deference being shown by Mr. Stronach’s daughter and his former trusted adviser. The gloves are now off, with an Ontario judge expected to decide who controls the family businesses going forward. In this slugfest, Frank Stronach’s hard-won reputation as a business visionary is already taking serious hits.